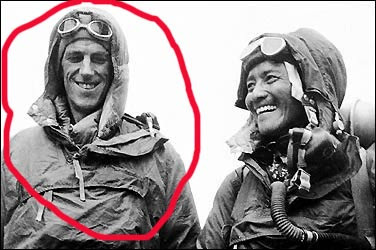 A sad day for Sherpas and non-Sherpas alike as Sir Edmund Hillary, first (white) guy to conquer Everest, died. Hillary will be forever be remembered as "that guy who paid us to climb our mountain, and thus doing so, started others coming to pay us to climb our mountain." Reached for comment at his home off the coast of Thailand, Santosh Bishnu, 73, the owner of "Santosh Oxygen Tanks, Inc." an oxygen tank business, called Hillary “a true gentlemen”, and Roja Narayan a seller of tents, concurred saying he planned to take his private jet to New Zealand for the memorial service. Officials in the Nepalese government have already announced they will observe Hillary’s death with 3 days of mourning in which flags will be kept at 1/2 staff and state-wide memorials will show the first 25 minutes of “Raiders Of The Lost Ark”, the highest tribute that can be paid by the Nepalese government to an individual. Elvira just died too, I wonder if she was older then him though?